Series ZYD Double-stage insulating oil purifier can quickly remove water, trace water, gas, particles as well as acetylene, hydrogen, methane and other harmful ingredients from oil. Series ZYD effectively improve oil's dielectric strength, effectively to make sure electric equipments working safely and normally. Series ZYD oil purifier is particularly suitable for treating high-grade transformer oil, supper-voltage transformer oil and new transformer oil. It can be used for more than 110V substation live line work onsite. Meanwhile, Series ZYD oil purifier can be used as independent vacuum source with functions of vacuum drying and vacuum oiling. 1. Pre-Electromagnetic-valve before vacuum pump to prevent the vacuum oil flow backwards. 3. Two vacuum separating chambers, efficient oil film sprayer, increasing separating size and separating time to ensure the dry-level and dielectric strength improving greatly. 4. Duplex-Stereo film evaporation technology, combined with unique and advanced dewatering, degassing components, can rapidly and effectively separate water, gas from oil. 5. Adopt interlocked protective system, which connect oil pump, heater and liquid level sensor, avoiding blank heating, blank pumping, oil leak and electricity leak. If there is any fault, machine will be power off automatically. 6. Pre-gas-water separator before vacuum pump to prolong the vacuum pump and vacuum pump oil. Series ZYD oil purifier can increase the working effectiveness more than tree times, more quickly and completely dewater, degas, remove particles to get higher dielectric strength. 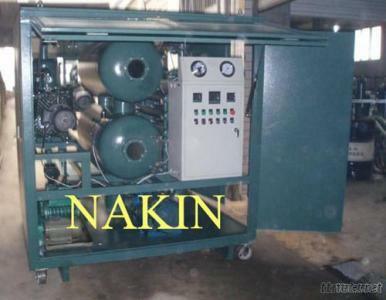 This equipment can be used as independent vacuum source with the functions of vacuum drying and vacuum oiling for the electric plants.